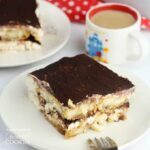 This no-bake Tiramisu Icebox Cake comes together in minutes and is the perfect dessert with a cup of coffee or after a traditional Italian meal. Set a kettle to boil. Place 2 teaspoons instant espresso powder in a bowl wide enough to dip your lady fingers into and add the boiling water when ready. Set aside to cool. In a large bowl, mix together the cream cheese, ricotta cheese, half and half and powdered sugar, adding more half and half as needed to get a smooth texture that can be spread with an offset spatula or spoon. Set aside. Line a 13x9 casserole dish with parchment paper. When the coffee has cooled to touch, add the Amaretto and dip each lady finger one by one into the coffee and make an even layer on the bottom of the casserole dish. Take several spoonfuls of the cream cheese mixture (about half) and place it overtop of the lady fingers. Carefully spread into an even layer using the back of a spoon or an offset spatula. Use a sifter to gently add a layer of cocoa powder (half of the amount called for). Repeat with another biscuit layer, another cream cheese layer, and a final cocoa powder dusting. Set in the fridge to firm up, at least an hour or overnight. This recipe for Tiramisu Icebox Cake was printed from AmandasCookin.com - https://amandascookin.com/tiramisu-icebox-cake/ and can only be printed for education or personal use.